Despite the C2750 coming to market officially in Q3 2013, we have not seen many products that exploit the possibilities that the new 8-core Silvermont SoC provides. We reviewed the C2750D4I earlier this year, but now GIGABYTE wants to step up to the place with a version of its own, called the GA-9SISL. 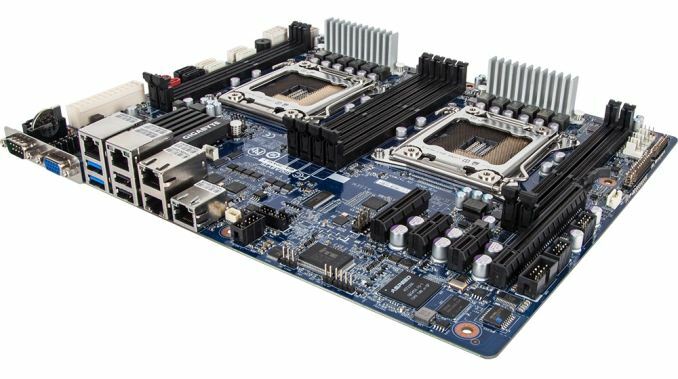 The focus of this motherboard, aside from the mini-ITX form factor, will be the 32GB ECC UDIMM DDR3 support and four Intel I354 Gigabit NICs alongside AST2400 management. 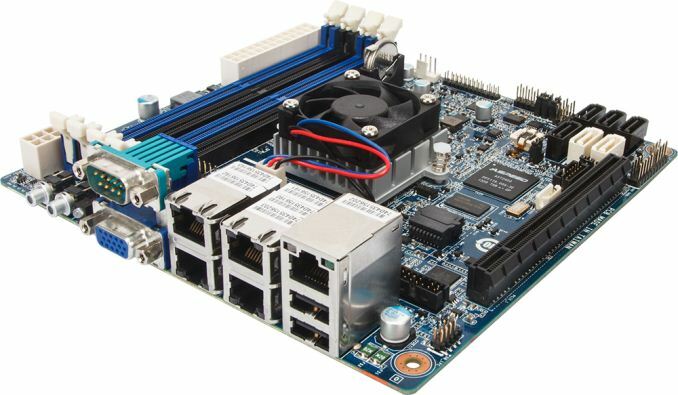 The networking is the focus here rather than storage, although GIGABYTE does use the six on-board SATA ports and suggests that a RAID card is used in the full length PCIe 2.0 x16 slot. The system also features active cooling with a small heatsink and a TPM header, although no USB 3.0 controllers. Next up is the GA-7PXSL1, dual processor motherboard for Ivy Bridge-E Xeons in a standard ATX form factor. Because of the large size of the LGA2011 socket area, along with the associated DRAM slots, the sockets are aligned one above the other and at 90º compared to what the consumer range is typically used to. This is so airflow can travel over the VRMs, then the CPU heatsink and finally out of the rear of the case. It also makes for some interesting PCIe placement, with a PCIe 3.0 x4 and two PCIe 2.0 x1 ports near the bottom of the board and a PCIe 3.0 x16 (wired at x8) right at the bottom. Despite the fact that each of these CPUs should be able to handle 40 PCIe lanes, most of them are unused in this motherboard as the focus is purely on density in an ATX chassis. Some of the PCIe lanes from the chipset are diverted into four Intel 82574L Gigabit NICs, as well as an AST2300 for server management. Due to size limitations there is only one DRAM slot per channel, making eight total, but they will support ECC and non-ECC UDIMM and RDIMM modules, with 1.5V modules supported up to 1866 MHz on E5-2600 V2 processors. 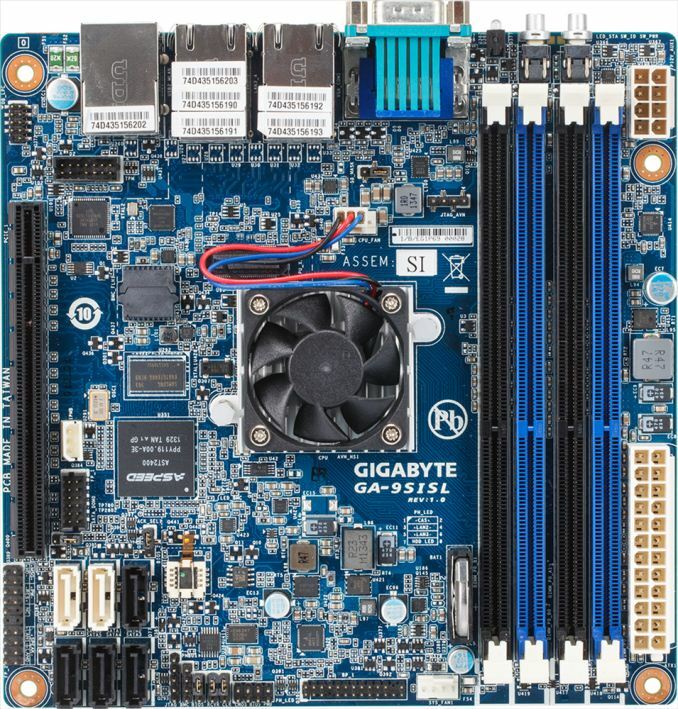 GIGABYTE Server is also releasing the GA-6PXSVL, a 1P LGA2011 ATX motherboard with a total of fourteen SATA ports (8x SATA 6Gbps from Marvell 88SE9230, others from chipset) and support for x16/x16 or x16/x8/x8 PCIe 3.0 lane allocation. I have reached out to GIGABYTE for release dates and pricing. With Computex around the corner, we should see a couple of these in action then. There are 2x 6GB, 4x3GB SATA ports. Could do a pair of SSD's on the 6GB with some 4TB drives on the 3GB but really this lends itself more to an IDS/IPS/Firewall unless you want to toss in an HBA and at which point it looks like a decent ZFS build....but it all comes down to what the street price will be.